11 August. Cadets of the Hsingan Military Academy, an officer’s school in Wangin Sum (Wangyemiao) training Mongols in Manchukuo, are ordered to retreat to Baicheng to the south to prepare to fight against the Soviet–Mongolian Army. 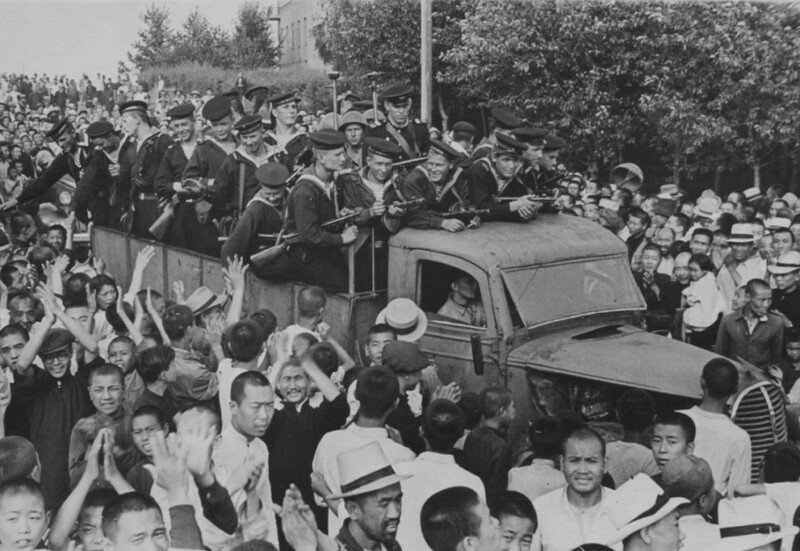 En route, they rebel and kill their Japanese instructors, reversing direction and joining the Soviet–Mongolian forces advancing from the north. 13 August. In a speech in Yen’an to his cadres on the situation after the war, Mao Tse-tung emphasizes his determination in the face of a likely future conflict with the KMT. Chu Teh therefore refuses to comply with Chiang’s instruction to stand fast and await orders, and moves his troops toward Manchuria. 14 August. In former Manchukuo, Mongol leaders Hafungga and Buyanmandakhu form a Committee for Inner Mongolian People’s Liberation. Working together with the Soviet–Mongolian Army, they soon establish a guard corps consisting of former cadets of the Hsingan Military Academy to maintain security in Wangin Sum, the centre of Mongolian administration under Manchukuo. 12 August. Hard bargaining continues between Chinese and Soviet negotiators in Moscow; U.S. ambassador Averell Harriman asserts that any treaties to be signed between China and the Soviets must be consistent with the Yalta Agreement. 12 August. With Soviet–MPR forces advancing more than 100 km a day, the Kwantung Army’s strategy of defence in depth is in tatters. Only at Hailar is the resistance holding. Meanwhile, thousands of Japanese settlers – mainly women, children and the elderly – attempt to flee to safety but many are engulfed in the fighting or attacked by vengeful locals. Others choose mass suicide. 16 August. Although the Kwantung Army commander-in-chief orders them to lay down their arms, several Japanese divisions to continue to fight due to poor communications or outright defiance. Next day, Stalin orders his commander to continue the advance despite Japanese requests to organize a surrender. Several pockets of resistance are bypassed as the Soviets race to seize as much territory as possible before a ceasefire. Many Japanese civilians trying to retreat to the south also die, often by suicide (or killed by their parents) to avoid capture by Red Army troops.